African BAOBAB SEED Oil 100% Pure 0.5 Fl. oz. - 15 ml. African BAOBAB SEED Oil 100% Pure 1 Fl. oz. - 30 ml. AFRICAN BAOBAB SEED Oil is rich in gamma linoleic acid, or GLA, which comes from essential fatty acid ,vitamins A, E and D & F and a remarkable stable source of omega 3 & 6 & 9, ideal light moisturizer for everyday use. AFRICAN BAOBAB SEED Oil is PURE/ UNDILUTED / REFINED with no chemicals or synthetic solvents. No fillers, additives or artificial fragrances added. Non toxic, does not clog the pores. Absorbs quickly, leaving a light, non-greasy feeling. Not tested on Animals, DOES NOT CONTAIN Preservatives. AFRICAN BAOBAB SEED Oil is very beneficial for plumping and firming the skin. Suitable for all skin types, it is a great aromatherapy carrier oil, massage oil or after bath oil. Used topically for WRINKLES, SCARS, STRETCH MARKS, RASHES, BURNS, ACNE SCARS, DRY SKIN, CRACKED SKIN, ECZEMA, PSORIASIS, CELLULITE, ACNE AND OTHER SKIN CONDITIONS... AFRICAN BAOBAB SEED Oil is highly recommended for DRY, CHAPPED LIPS , BRITTLE NAILS and ANTI CELLULITE. AFRICAN BAOBAB SEED Oil is highly recommended for DRY, BRITTLE AND DAMAGED HAIR to encourage healthy hair growth, repair split ends and increased vitality. Baobab Seed Oil spreads nicely, makes the skin soft, smooth and supple. • Baobab Seed Oil is one of the best natural skin moisturizers because of its lightness—it moisturizes dry skin without leaving it greasy. Vitamins A and E, unsaturated fatty acids and palmitoleic, oleic and linoleic acids provide its great moisturizing and nourishing qualities. • This oil is a great skin purifier that makes your skin glow naturally. A healthy natural way to help reduce dry skin inflammation, redness and itchiness, it is also an ideal moisturizer for those with psoriasis, eczema, and easily irritated skin. • Baobab Seed Oil is also a good way to tighten the skin and reduce the appearance of wrinkles and puffiness. • Suitable for all skin types, it is a great aromatherapy carrier oil, massage oil or after bath oil. 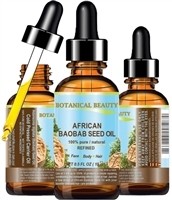 African BAOBAB SEED Oil 100% Pure 2 Fl. oz. - 60 ml.